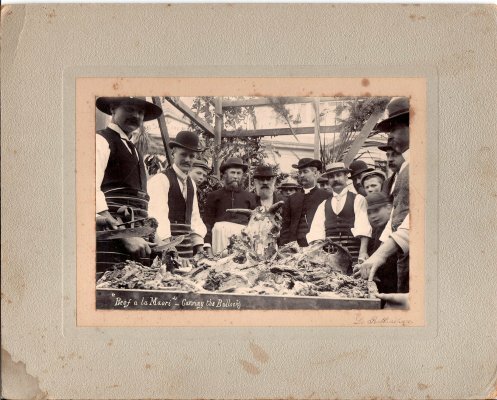 Description Photograph of The carving of meat at the celebration of the Coronation of Edward VII 1902 on the Beef a la Maori stand. On the back is written: "The roasting and carving of a bullock in Blenheim in the good old days"
Men named left to right: Harvey Cheesman, Jack Adams, Johnnie McKenzie, Harry Hammond, Archdeacon Grace, Sid Adams, Frank Hammond , George Adams edge of photograph. This photograph was scanned in 2008 and the scan was put in the Changing - Photographers of Marlborough display.